WILLIAM ECKLER, farmer, Clay Twp., Sec. 17; P.O. Clay Mills; is a native of Herkimer Co., N.Y.; was born in 1824. He married, in his native county, Miss Susan M. Hall; in 1850, they came to Iowa and settled in this (Clay) township. and it has been their home ever since; their children are William A. (who married Charlotte Wilcox, and resides in Taylor Co., Iowa), Jane A. (now the wife of George Hannas; he was a soldier in the army of the Union during the war of the rebellion), Roseltha (wife of P. C. Blackmer; he also served in the Union army during the war), Josephine (now Mrs. A. Robinson), James A. Mr. Eckler and wife are members of the Free-Will Baptist Church, in which church he is a member of the Board of Trustees and is also Treasurer; politically, Mr. E. acts with the Republican party. His farm consists of 212 acres of land, and the improvements thereon are among the best in Jones Co. Mr. Eckler has been elected to several offices of honor and trust, all of which he discharged the duties of with credit to himself and general satisfaction to the public. All his life, he has been very liberal in support of religious and educational institutions. Among the older generation of farmers of Clay township who have not yet completely given up interest in agricultural matters, despite his advancing years and the fact that others of greater strength and possessed of the enthusiasm of younger years have assumed their heavier, cares is William Eckler. He was long known as one of the most enterprising and successful farmers as well as one of the early settlers of his township. He was born in New York, June 16, 1822, and there grew to maturity, was married and lived until 1852, when he came to Iowa. Here he bought the farm of one hundred and sixty acres on which he is still living and also sixty-two and a half acres of timber. The fields, which have proved to be such rich, arable land, were at that date in the wild state, but as it was prairie, the work of preparation for the reception of seed was not as severe as if the land was wooded, yet there was much to be done in breaking the land before he might sow his crops. He built all the houses and barns which now cover the place and instituted whatever other improvements were necessary. As in his New York home, he followed other pursuits in conjunction with his farming, so, after coming here he engaged in milling. He erected a sawmill at Clay Mills, which he operated throughout the whole year and until within a few years ago when he sold it, that he might give more attention to purely farming interests, for he found that stock raising afforded an even greater opportunity for a fortune than did the cultivation of cereals, and each year he gave more and more attention to it, feeding a large number of hogs and cattle for the market. Recently he has abandoned all active participation in the work of the farm, feeling justified in retiring by the fact that he had won a fairly large fortune in return for his labors. While still living in New York state, Mr. Eckler was married to Miss Mathilda Hall, also a native of that state, where she was born May 27, 1825. She died in 1898, having reared a family of five children, namely: Adelbert, who was born in Herkimer county, New York, April 30, 1845; Jane A., who was also born in Herkimer county, October 13, 1847, and has married George Hanna; Roseltha, who was born in Iowa, December 15, 1853, and is the wife of Peter Blackmer; Susan Josephine, who was born in Iowa, February 18, 1861, and became the wife of Archibald Robinson; and James, who was born in Iowa, July 19, 1867, and has also married. Mr. Eckler is a republican in his political views and has participated in the public affairs of his township, for he served for a number of years as justice of the peace. Many years ago he gave land from his farm for the erection of a school and the Baptist church, contributing generously to the latter for its building and later for its support. Mr. Eckler has been deacon of that church for a long time, and is still active in its work. When he started upon his business career he was without a dollar, but through industry and good management, united to wise judgment, he has accumulated a bountiful property. As it is the result of his own efforts, it carries with it no bitterness as do frequently fortunes which have been accumulated upon the misfortunes of others, and the record of his life is one which commands the respect of all. 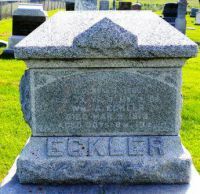 Mrs. Eckler, too, had the love and admiration of all during her life and was a devout member of the Baptist church, in which faith she died. [S00065] Eckler-Ackler-Ackley Family, The, A. Ross Eckler, (1970, Morristown, New Jersey), Page 202. [S3922813830] ANCESTRY.COM - Family Trees, ancestry.com, (Provo, UT, USA: Ancestry.com Operations, Inc., 2010), [database online]., http://trees.ancestry.com/tree/5531052/ (Reliability: 3). This tree is from a friend and her research is very good and should be treated with more respect then a normal Ancestry Tree. [S3922814029] FindAGrave.com, (Find A Grave, Inc.), http://www.findagrave.com/cgi-bin/fg.cgi?page=gr&GSln=eckler&GSfn=william&GSbyrel=all&GSdyrel=all&GSob=n&GRid=22604038&df=all&.